The Count counts no more. So, I realized that despite the 20+ unfinished posts waiting in the underground of this here blog, I didn’t get a darn thing posted in August. Even though it is after midnight in my corner, the West Coast still has over an hour. I’m posting this and we’re all going to pretend it was in August. Though the show goes on, it is sad to know the life behind it has faded to black. 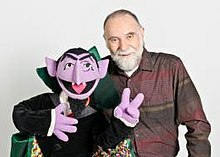 Last week the world lost the man behind the Count, Mr. Jerry Nelson. I am uncertain who to credit for the sadly sweet drawing, but it was first seen (by me) on Facebook. The photo is of “Nelson in a Sesame Street publicity photograph from June 2012. Here he is pictured with the Muppet Count von Count.” Taken from Wikipedia, of all places. Four years ago, I had the fantastic artist, Mr. Ben Rettke, put this piece on the outer calf of my left leg. Count von Count was one of the first “people” I ever had a crush on, and he was by far my favorite Muppet. Previous postLet’s network this out.